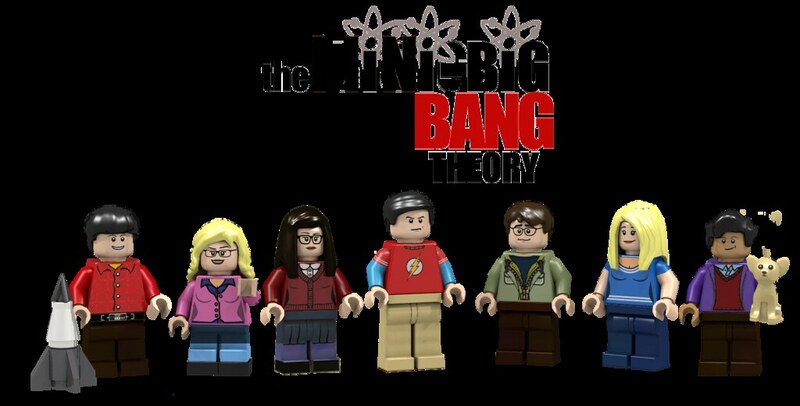 Welcome to the campaign page for LEGO Big Bang Theory; a collaborative project by Alatariel and GlenBricker. 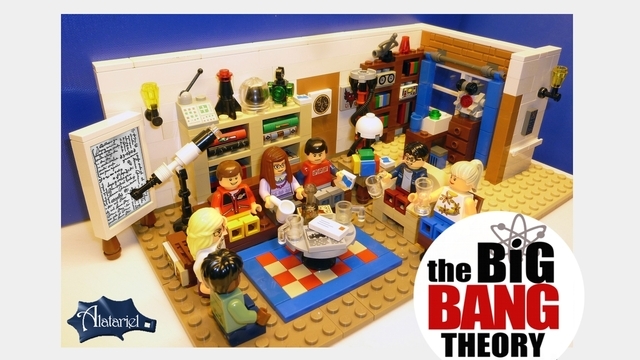 LEGO has selected our Big Bang Theory LEGO Ideas proposal to be an actual LEGO set! Alatariel and I (GlenBricker) are not only deeply honored that LEGO has made this decision, but also excited and proud to be some small part of a show that we both love. This proposal has been an amazing ride right from the moment it was posted to Ideas, and with reaching 10,000 in less than a month, was once of the fastest projects to reach that goal. We give the deepest thanks to all those who voted for the project as well as shared it with their friends, families, and readers! Without your support this, quite literally, would not be possible. Congrats to the LEGO Birds project! We hope to see some Doctor Who sets make the next review and our deepest sympathies go out to those projects that were not picked up. We know that you have poured your heart and soul into your Ideas Campaigns and that getting to the review, without reaching production is incredibly disheartening. For those wishing to rework their concept and post again, we wish you the best of luck. For the Doctor Who fans out there, to showcase how much we all love Doctor Who, please consider also voting for the 10th Doctor's Tardis project. The more votes in ANY Doctor Who project there are, the more likely it is that at least one project will get produced. For those still reading, who have enjoyed our work, please excuse this moment of crass promotion of our other projects. 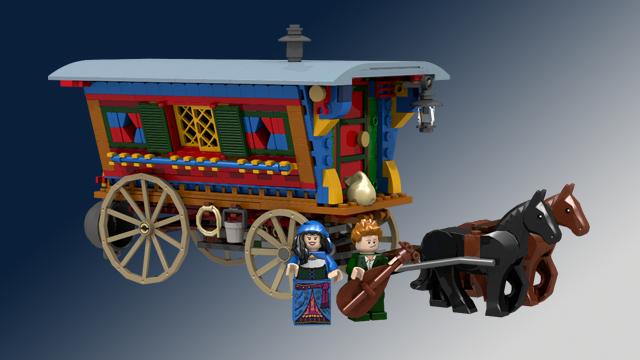 This build is based on the Reading style wagon of the Romani People. The project itself however was inspired by the works of Patrick Rothfuss. Alatariel has a new project in the works. If you liked the Research Institute or Big Bang Theory there is a pretty good chance this one will also appeal to you. When it does get published you will find it at this link. 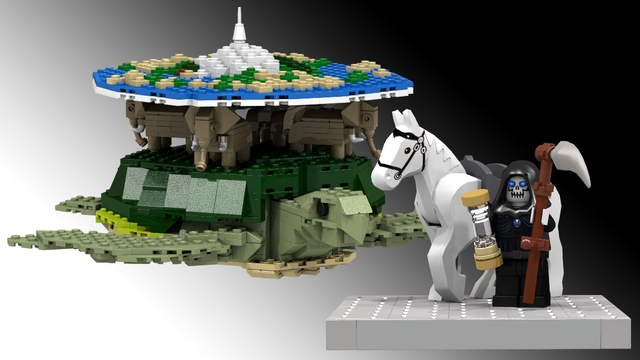 This is a project based on the popular Discworld novels by Terry Pratchett. Alatariel is not only a fan of Science and Big Bang Theory but also of classic console games. 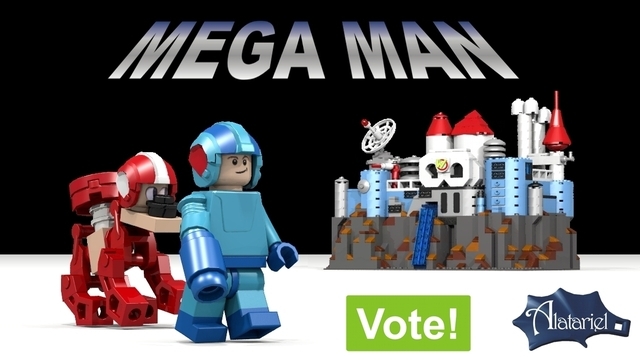 This is her LEGO take on the side scrolling platformer Mega Man. This project is an attempt to capture the creativity, magic, and science from the ever popular Magic School Bus series of books and shows. 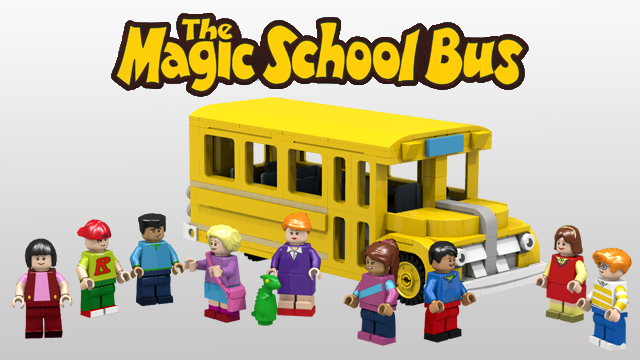 Rebuild the bus into a variety of shapes while using LEGO to explore science and imagination. 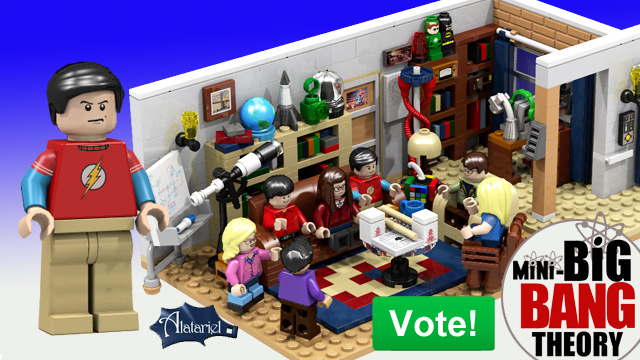 This page is dedicated to project content and features we can't host on the LEGO Ideas Page, like the "Pick your Sheldon" poll. Sheldon is well knows for wearing iconic shirts. We were having trouble deciding on which shirt is best. Here are the results of the Poll that we used to help aid in our decision of which rogues to include in this proposal. Can you identify all of these items? 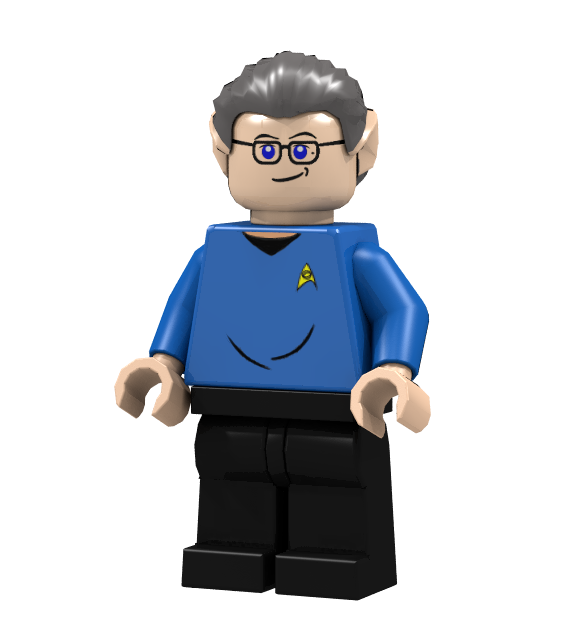 Bill Prady, the Executive Producer of The Big Bang Theory, seriously helped us out by sharing this project with all his Twitter followers and as a thank you we have re-created his Twitter avatar as a Lego Minifig. I'm not so sure that Sheldon should have such an angry looking face. Surely it should be smug with shades of "I told you so!," on the side? It is difficult to get the perfect expression on a figure. Rest assured, Lego will produce figures with perfect expressions. This is really only a proposal for the product. Maybe so but for a kid's toy we should see a happy Sheldon and he's only happy when he's smug. LOL! He can have two faces as I have seen on other minifigs--maybe a BAZINGA face and one other? I like the Smirk face for Sheldon, and maybe as an inside joke include the Blue Jay, "Lovey Dovey" that terrified sheldon for almost an entire episode and put the "scared face" on the opposite side of the head. kind of like the "Marty McFly" mini-fig. I think many BBT fans would enjoy the little side joke. He could be smiling! He might be thinking about koalas! I'd prefer Sheldon in the E.Nigma (from Batman) t-shirt. That with the bats making a question mark. 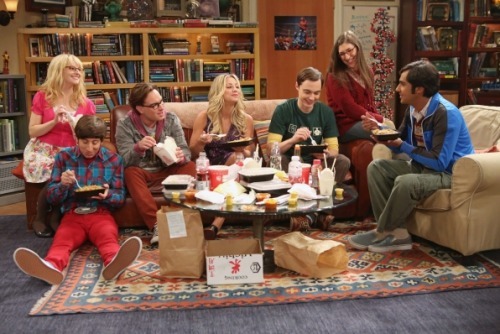 The image of comparison is not the most common, usually is Rajesh sitting in floor and penny's where Rajesh is sitting. I LOVE this set! I really hope it comes to fruition. Your progress chart is showing the days counting down as opposed to increasing. When you hover over the line, the top number gets lower as the bottom "support" number gets higher. Just thought I would mention it since you are likely to get a lot more hits on this page, the more word gets around! 73 is the best number as Sheldon says. It must be 73! I wish you could get Sheldon dressed as the Doppler effect. Maybe release some alternate figure bodies that look like costumes the crew has worn to various ComiCons and Halloween parties in the series? I say put in a couple of the shirts. 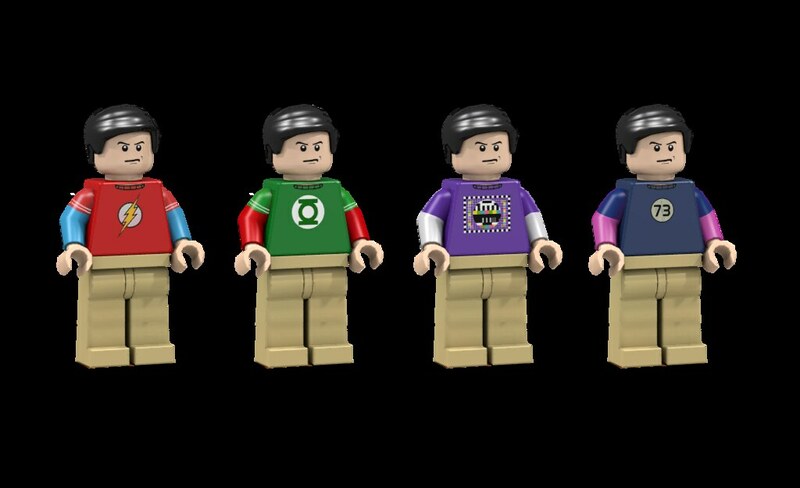 I like the flash one, but his melted rubiks cube shirt was really cool. 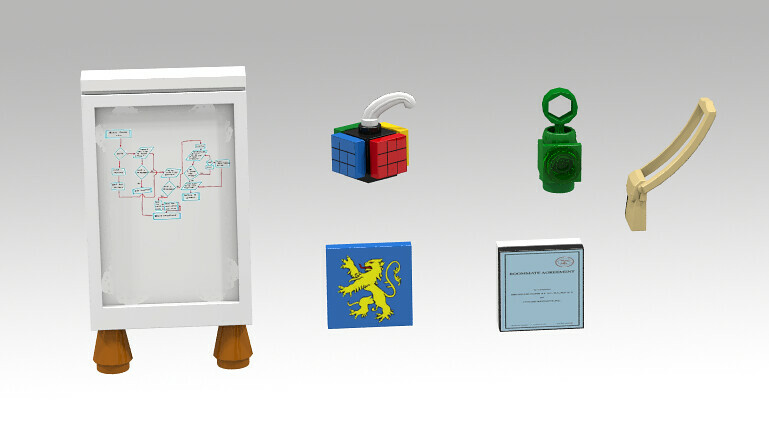 I think that would go well with the rubiks cube tissue box in the set. Sheldon Coopers Fun with Flags! i sooooo need this set!!! There needs to be a second set of the comic book store with Steward and an evil Wil Wheaton. That set should include the main male characters with their 2nd favorite outfits. 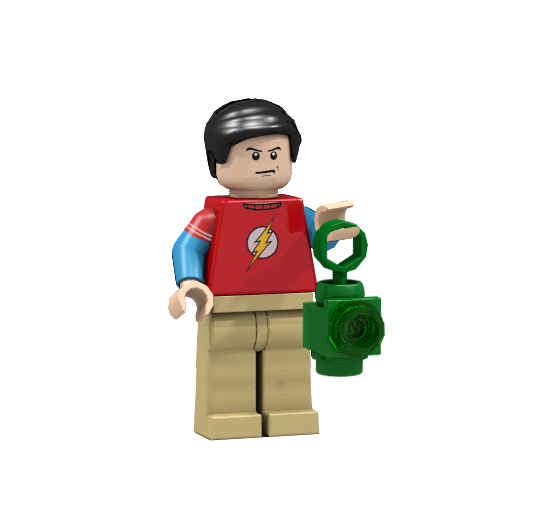 Sheldon's main outfit has to be Flash. Tried the voting button, but it didn't work. My vote is for Sheldon in the Green Lantern shirt! There must be a copy of the Roommate Agreement! I think Sheldon needs two shirt choices in the kit. I think the set should be of both Penny and Sheldon/Leonard's apartment with the hallway and broken elevator in between. Also Penny does sit on the floor in one episode I think it's S07E16 where they buy a dinning table. Also it would be great to have a change of clothes for the guys but this time costume outfits. i.e. Flash/Aquaman/Hobbit/Peter Pan ;) or ComiCon outfits from StarTrek. 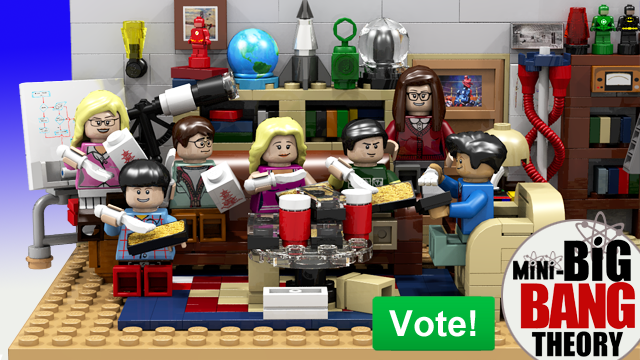 Everybody's favorites: LEGO and Big Bang Theory! i have had Lego through 2 generations the second is 7 and cried for joy when a friend of mine gave him a tote full of her sons. This set is going to be MINE! PLEASE HELP! I just so need to know approx. when the LEGO BIG BANG SET will be in stores! I know no news about that have been released, but maybe you have an unofficial, off the record guess???? Many thanks! when is this set coming out ?????????? OMG I love this set so much!! Is it coming out in the UK? really nice blog and very useful. very nice..and you made great effort.. Thanks for taking time to share this page. It is really helpful. Simple and neat explanation with a clear view, awesome great post! Your blog is awesome. I have enjoyed reading your post. Thanks for sharing this big bang theory concepts. It is really helpful, keep sharing more like this. Thanks for Sharing such a Wonderful Post!!! Perfectly written article. I just loved reading your article. Keep sharing such articles. I'm glad that I found your post. Keep sharing. Wonderful post with great piece of information. I Really like your article. Keep sharing more. Best blog, Thanks for your information.